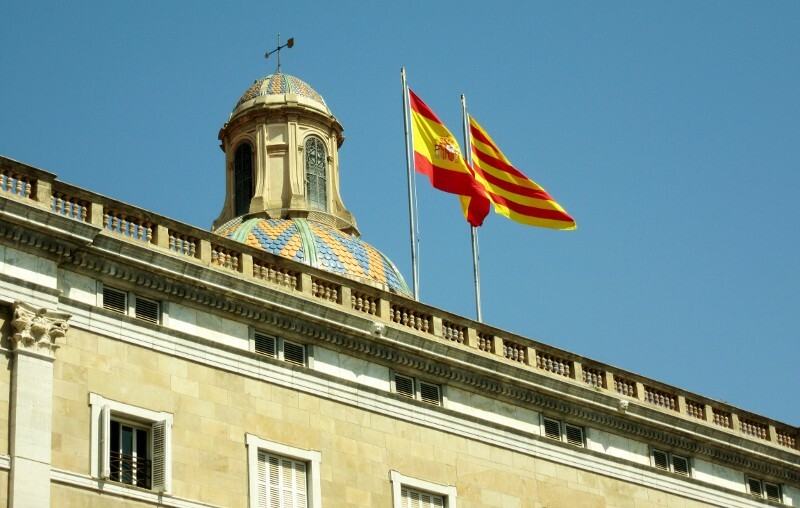 Luckily, in Barcelona there’s any number of things for a visitor to see regardless of where you look and one of the best ways is just walking around the city. 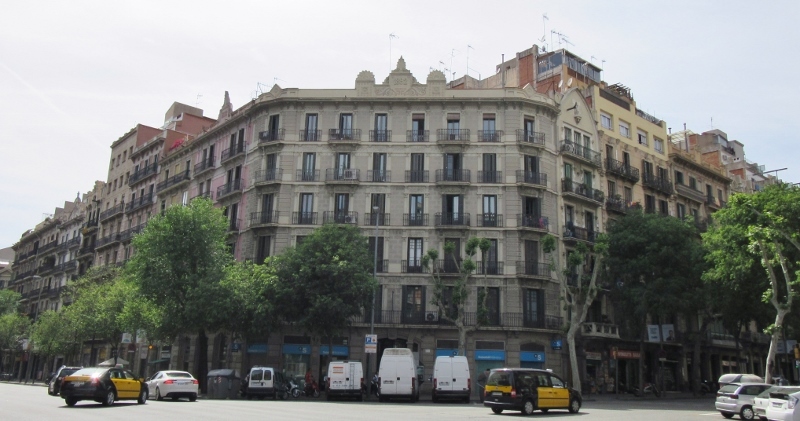 Our apartment was in the Eixample (Catalan for extension) district, a 19th century urban expansion that merged the old city with the villages and towns nearby. 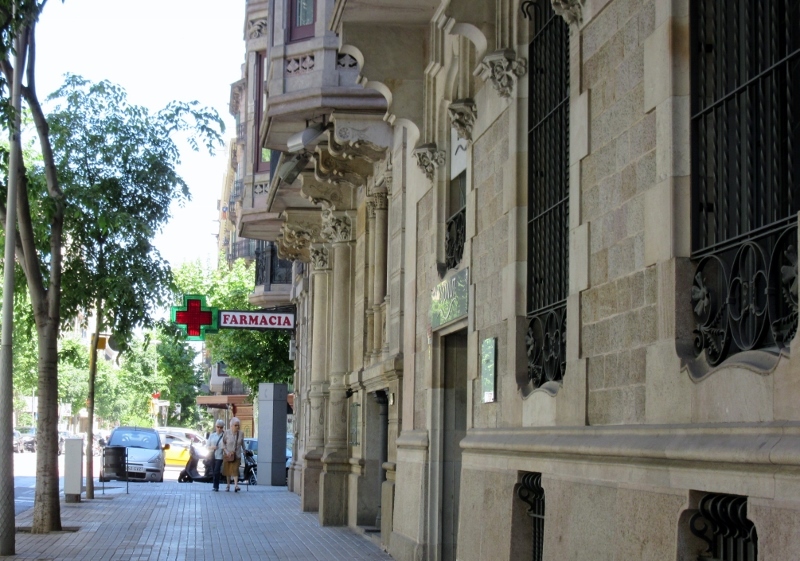 The urban plan was the brainchild of the progressive designer and Catalan Spaniard, Ildefonso Cerdá. A strict grid pattern of long straight streets crossed by wide avenues helps to keep even the most directionally challenged people (we’re not naming names) oriented. Of course it helps that the streets have signs and numbers on the buildings and maps are readily available at tourist information sites as well as online. The thing we were most taken with however, was Cerdá’s unique design of octagonal blocks (picture the corner building with its corner cut off) which allows for greater visibility at each intersection. 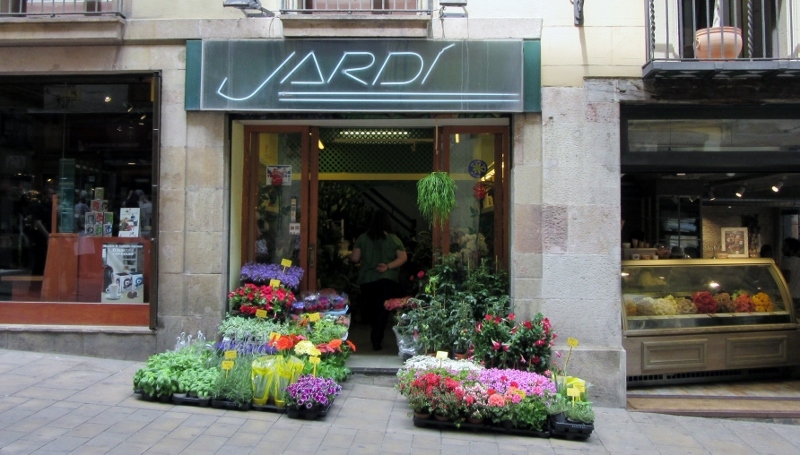 A five to forty-five minute walk from our apartment in any direction could take us to a flower, bakery or ice cream shop. Or we could find a grocery store, farmacias (pharmacies) with their crosses of green or red displayed, organic fruit and vegetable shops and numerous ATMs as well as metro stations. And of course there were elegant churches. 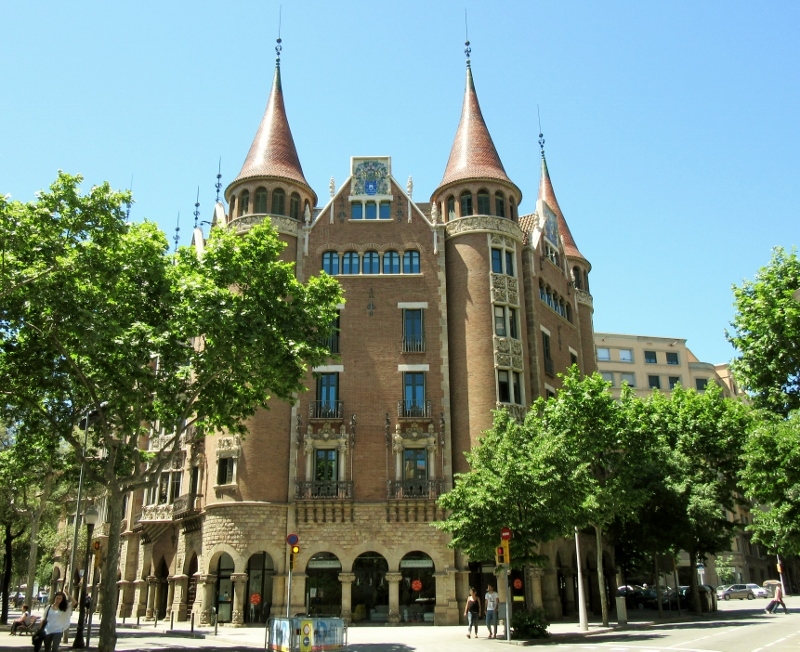 Nearby, we found numerous restaurants and tapas bars, trendy clothing stores and even a castle called the “House of Spikes” built in 1905 by the Terrades sisters. One Saturday we came across an enterprising company who had set up ping-pong tables on the wide sidewalks near the landmark, La Pedrera. And on another sunny afternoon people relaxed near an avenue in lounge chairs that had been set out in the common area as an urban park. 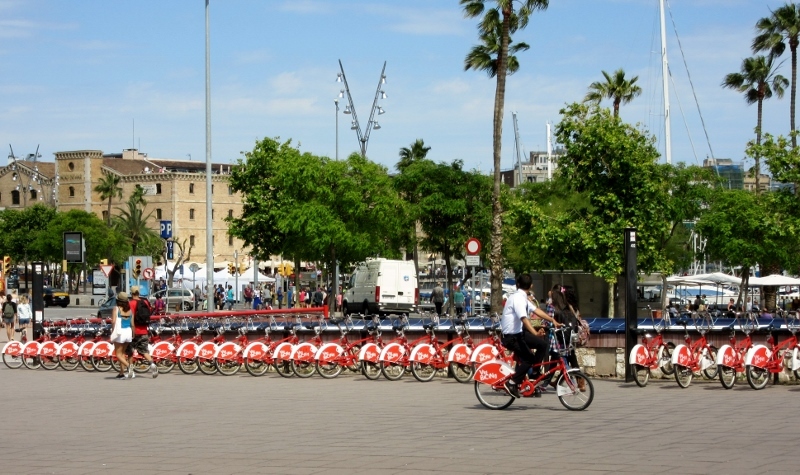 And we found one of Barcelona’s locations for its bicycle borrowing program called “El Bicing” where we could take one of the free city two-wheelers for a short spin. Another way to look up, down and all around was riding around on the double-decker hop-on, hop- off buses. We took advantage of these to orient ourselves to the city as well as sight-see and while we rode inside the bus for a few stops, riding on the upper level gave us an entirely different experience that we enjoyed much more. 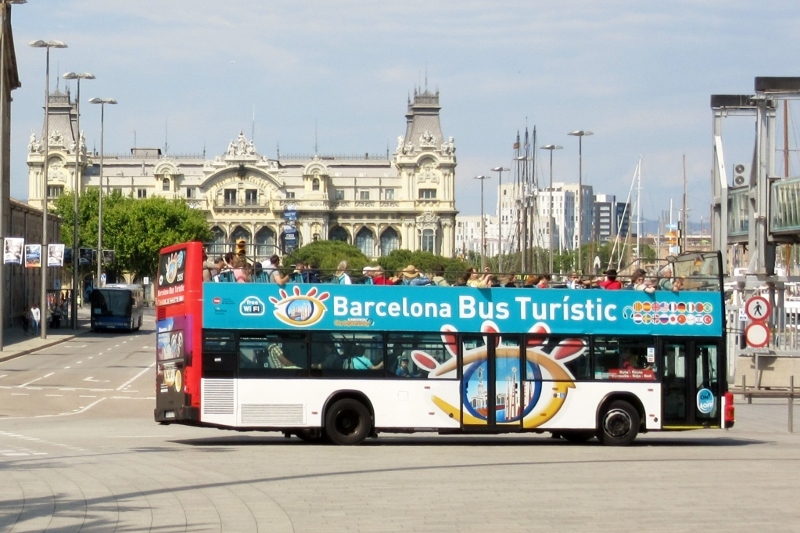 The city actually has two companies that offer the tours: the red buses from Barcelona City Tours with 2 routes and the blue and white buses from Barcelona Bus Touristic with 3 routes. 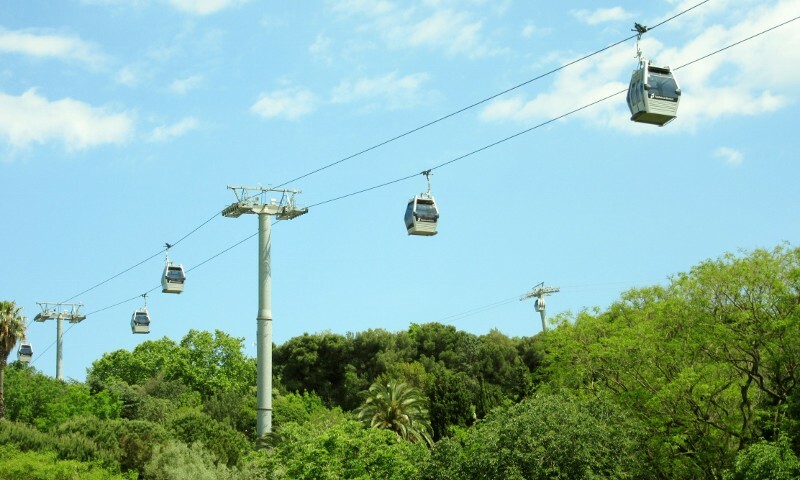 The prices are comparable, they both offer one or two-day tickets and each runs in a continuous loop from early morning to late in the evening so that passengers can hop off to visit the sights they want to see and then hop on for the next destination. Audio guides and headsets give information in several languages and explain each area’s significance, pointing out landmarks along the way and giving a little history. A few days into our visit to Barcelona both of us noticed our necks were stiff. It wasn’t too difficult to figure out the cause as we were continually tipping our heads back or craning our necks. There’s lots to see if one looks down, around and straight ahead but, in Barcelona it’s good to remember to LOOK UP too! Thanks for stopping by David. We loved Barcelona too and look forward to exploring more of Spain and its other cities when we return. Hopefully we won’t have to wait too long! Fantastic photos! 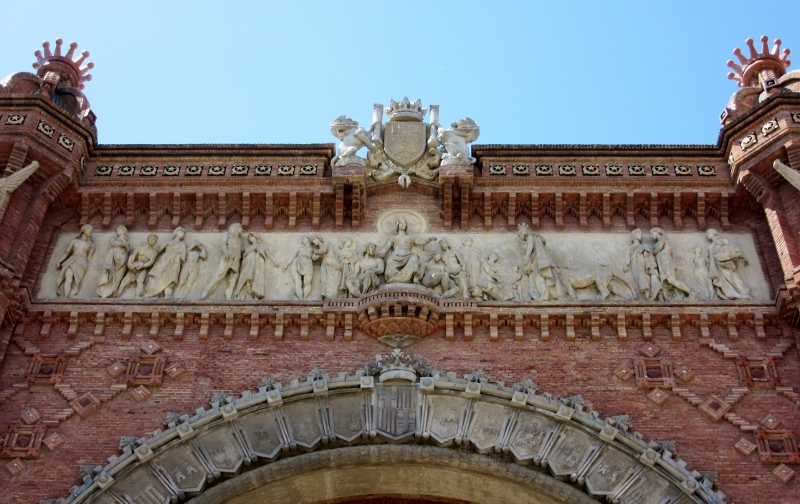 Your photographer friend had some great advice to look everywhere – it’s obvious by the excellence of your Barcelona photos that you did just that!! If we could have swiveled our heads the full 360 degrees we would have really been happy since we wanted to see as much as we could. So glad you enjoyed the photos! You are so right that in Barcelona, whether you are looking up or down there is something awesome to see. I also liked the unique intersections created by the cut building corners. The intersections were awesome and had us wondering why more cities haven’t adopted this style as we’re sure it greatly improves visibility which seems like it would lead increased safety for both drivers and pedestrians. It also made the streets feel much more open which meant we could admire more of the architecture! Thanks for the kind words and we’re glad you enjoyed the post! “Look up” – good advice for photographers as well as sight-seers :-). Looks like your apartment was well-situated for a good walking overview of the city. 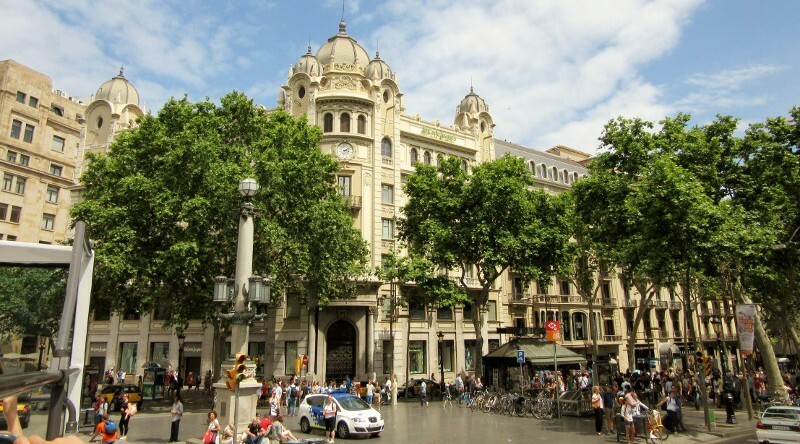 We really couldn’t have asked for a better location to stay as our apartment was close to the metro stops, many of the landmark architectural sites as well as restaurants, ATM’s and scrumptious bakeries (no dieting allowed in Barcelona! )The central location really added immensely to our experience of immersing ourselves in this marvelous city. Your photos are awesome, Noel and we appreciate you sharing your tips with us. Now, cameras ready … eyes open…and heads swiveling! Such good advice. And sometimes buildings (especially in England and Australia) retain their old parts on top while the bottoms are renovated to be modern … as in shop fronts. Ahh Barcelona so much to see though. We have yet to visit England and Australia but the old buildings sound like they wear their history in multi-layers which has to be fascinating to see. Sigh – so much to see, so little time … but what fun! Your photos are beautiful and I can imagine how much fun it is for you to return home from each trip and go through them. We take a lot of photos, delete a lot of photos and try to geotag and caption them weekly so that the locations and our memories don’t blur. It’s always fun to look back and see where we’ve been!. 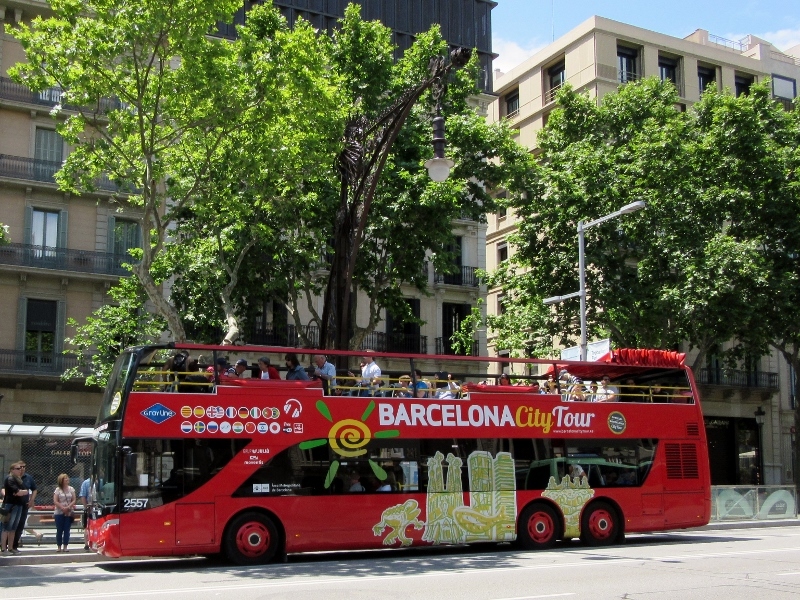 Love imagining how you toured Barcelona! We will never forget the advice and will be prepared to bring something for our necks. Or just lie on a bench to savor the architecture and other things to see up there! We toured Barcelona with what seemed like permanent smiles on our faces! I kind of like the idea of laying on a bench to look up because, in addition to the beautiful architecture, we saw some magnificent cloud formations contrasted against Barcelona’s deep blue sky. It seems like one could stay in Barcelona forever and still not see everything—much like New York City! Thanks for introducing me to a few new ideas for our next visit. We have to agree with you, Irene and these are the places that we look forward to visiting again and again. Cities like New York City, Los Angeles and San Francisco (to name a few) give travelers and visitors something new to discover each time. 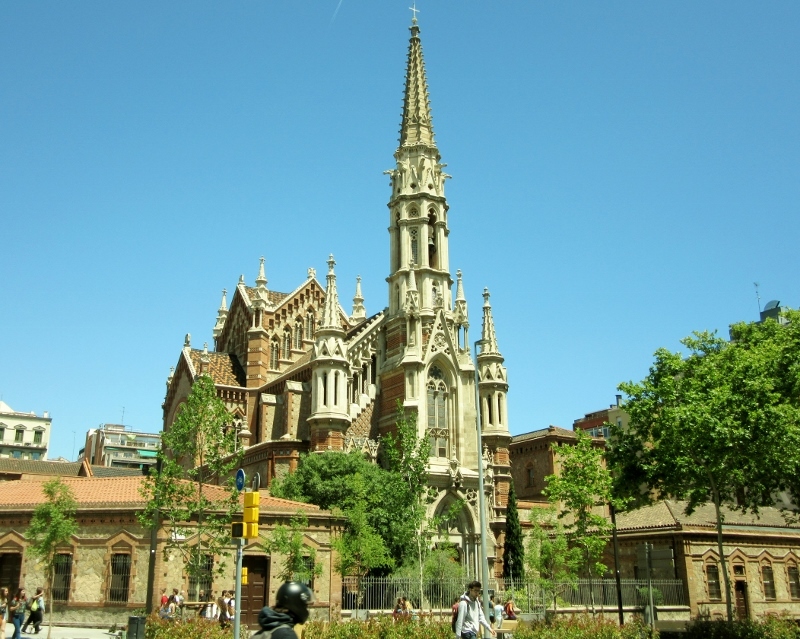 Lots of great advice here for exploring any city and Barcelona in particular. I really liked reading this post and looking at the photos because you so obviously enjoyed every part of this visit. I must say I do like the grid pattern because I am one of the ‘directionally challenged’! We always say that, with a map, we can conquer any city but I (Anita) have to admit that I suffer from directional dyslexia. It seems that my sensor turns off and I pick the wrong way without fail. That being said, I’m not afraid to get lost occasionally and it’s led to some fun discoveries. But we definitely prefer a grid pattern and also (praise God) love the GPS devices! Everyone we meet and talk to who has visited Barcelona agrees that this is a city that one returns to (hopefully many times) to catch everything missed the first time around. The hop-on, hop off buses did a terrific job of helping us get oriented as well as letting us visit some of the out-of-the way places in a time and cost effective way. Plus, there’s the added advantage of people watching from our higher perch! No matter where you look, Barcelona has it. I liked this way of tying in different aspects of your experience in the city we both enjoyed visiting for the first time this year! And I’m so happy we got a chance for a nice long chat in person for the first time, although it felt like we’d known each other forever. Another fond memory of a wonderful city. Thanks Betsy. 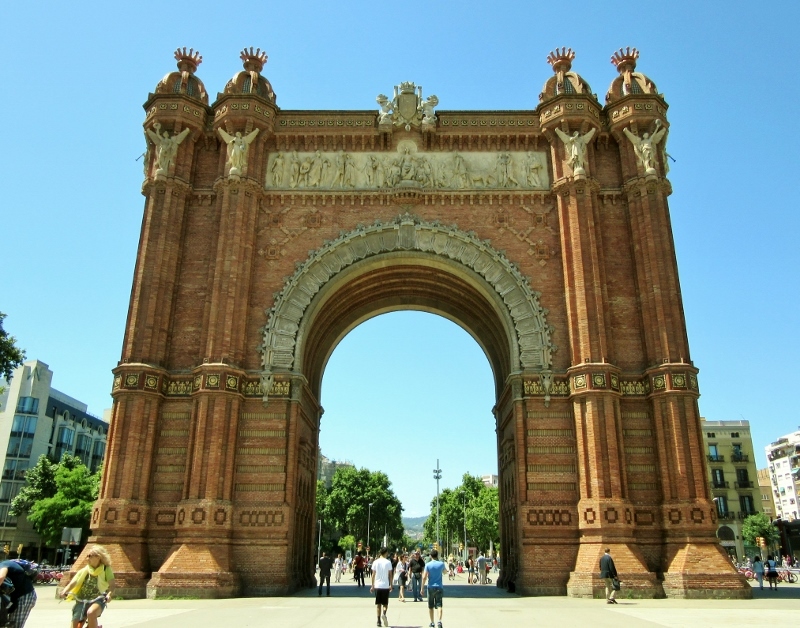 Barcelona has become one of our favorite cities and we plan to return to see what we missed on our first visit. I’m hoping our paths cross again soon (or that we make them cross) so that we can continue comparing our “parallel lives” and discussing our adventures and life in general. And maybe for our next meeting we’ll have more time and remember our cameras! I guess you could say that life is an adventure (especially on Ometepe Island!) and travel enhances the adventure. And of course we have to keep our eyes wide open and necks craned so as not to miss any of the sights! I agree there is a lot to look at in every direction in Barcelona. Your friend’s advice on looking up so as not to miss anything is excellent. Well worth the stiff neck. We have a few friends who are very good photographers and it’s an eye-opener to walk around a city and try to see see the things that might catch their attention. It’s a good lesson to walk a little slower and look at things from different angles and perspectives. Thanks Cathy. We remember you saying we’d love this city and you were right! It’s well worth the stiff necks to keep smiling our way through every new sight. We spent a month in Barcelona and are already talking about a trip to go back (maybe next year) and see more of the sights that we missed. And there’s no shortage of things to see in the rest of Spain and Portugal either! We’re already finding out that three months is NOWHERE near long enough but you’re sure to have an amazing time. Wow. A month in one city. I’ll have to think about that! Are you glad you stayed in the city center, rather than an outside locale? I have heard you get cheaper lodgings farther out of the cities, but I wonder how much convenience you loose? 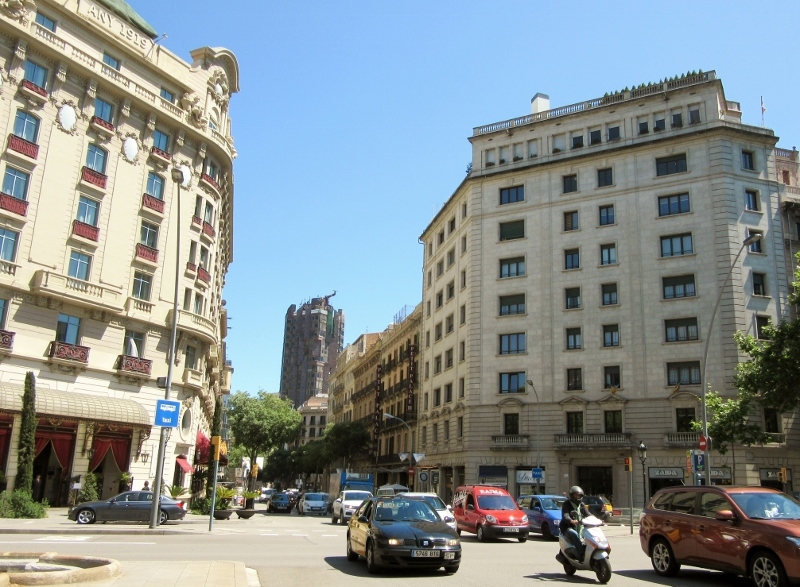 We really liked staying in the city center because so much of Barcelona was easily accessible by foot, metro, bus and taxi. It might end up for you as a balance of convenience and a city experience versus a less expensive and quieter location. And since we travel full-time, we much prefer one-month stays so that we can explore and learn about a city at our leisure or use it as a base to visit other places. But of course, we give up all the other sight-seeing we could be doing too… Decisions, decisions …! I imagine traveling as a lifestyle is more relaxing than the normal tourist trot. I am hoping we can find a slower pace, staying at three or four locations for a long-ish time. 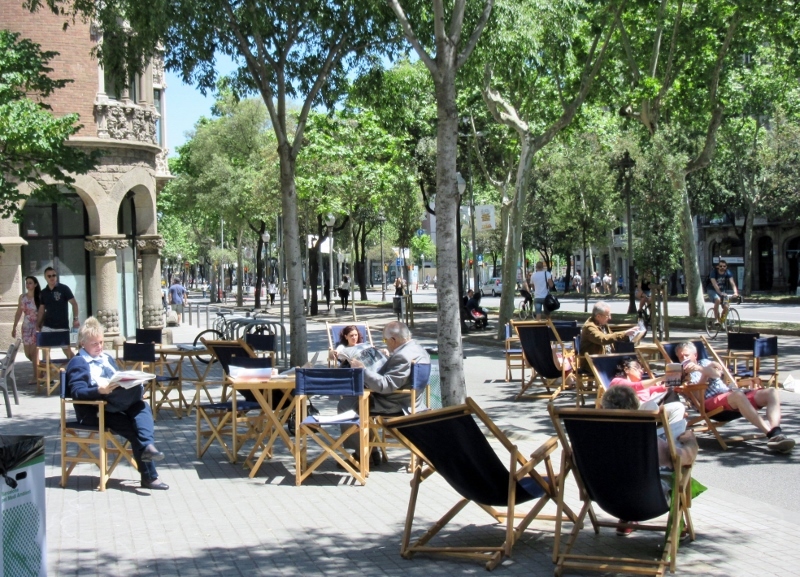 Hope your next locale is as nice a visit as Barcelona. I think you’ll enjoy the more leisurely pace. Slow travel is much more rewarding for us.since it gives us a chance to shop at local stores, cook differently or try new restaurants as well as decide each day what we want to see (or not!) Taking downtime is an important way to recharge too – seems a lot of people come home from their vacations tireder than when they went! Barcelona looks beautiful. Great post. I hope we get there one day. 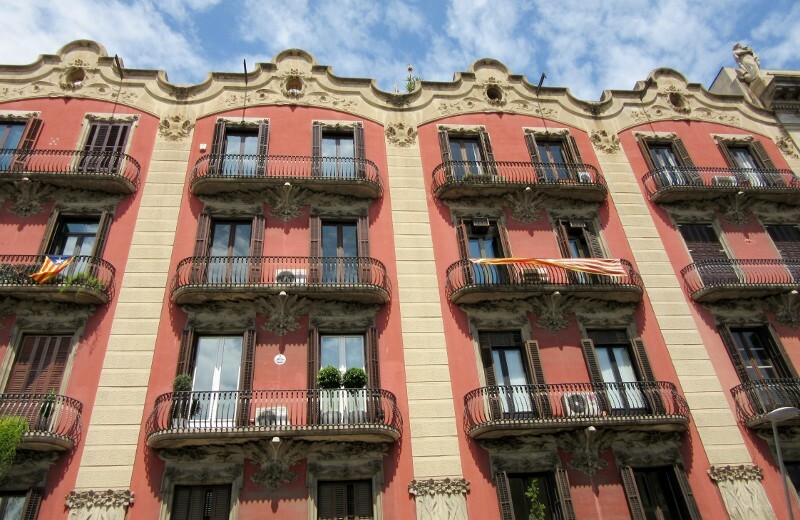 Barcelona’s a city that seems to have something to ooh and aww over on every block. I hope you get a chance to visit here too, Suzi ! Here it is the 4th of July and we wish you well on this largest of secular american holidays. We are having of course a whole bunch of friends and relatives over for the big feed. Wish you were around to help with the consumption. Wish we could take you up on the invite Keith, gorge ourselves on some good old USA hot dogs and watch some fireworks. However, we’ll look around and I’m sure we’ll find something to keep us entertained! You are so right Mary Anne! Hop-on, Hop-Off buses may be slow but they’re fun and a terrific way to get acquainted with a new city.